The communities of South Burlington and Winooski, Vermont, are currently seeing the effects of just such an alliance between the military, in the shape of the U.S. Air Force and its adjunct, the Air National Guard; industry, as represented by state commercial real-estate interests; and Congress, in the energetic form of senator and liberal icon Patrick Leahy, along with the rest of the state congressional delegation, including the self-proclaimed “socialist” Bernie Sanders. South Burlington and Winooski, two predominantly low- and middle-income towns, abut the Burlington International Airport, which hosts planes flown by a variety of airlines as well as the eighteen F-16 “Fighting Falcons” of the 158th Fighter Wing, Vermont Air National Guard, known as the Green Mountain Boys. Until recently, local residents had little quarrel with the air guard’s presence. The F-16 has been in service for forty years and has matured into a very safe airplane, suffering fewer than two “major mishaps,” as the air force calls crashes, for every 100,000 hours flown. Five years ago, however, residents began noticing that the fighters were making more noise during takeoff. The reason was simple: the pilots were using their afterburners, injecting extra fuel into the engine exhaust for added thrust, rendering the noise almost unbearable. As Chris Hurd, a real-estate broker living just over two miles from the runway, told me, “If I am on the phone inside the house during a takeoff, I have to stop talking.” Afterburner use became necessary because the guard command altered the planes — motivated, it said, by a desire to ease structural stress on the wings — so that they carried two tanks under their wings rather than a single external tank under their bellies, adding weight and drag and thus requiring extra power. F-16s take off at least once an hour, and almost every takeoff uses afterburners. The air force and the FAA later acknowledged that the consequent noise rendered nearby areas “unfit for residential use,” which led to a federally funded program for the voluntary buyout and subsequent demolition of almost 200 homes beginning in 2008. The relevant properties were then eligible to be rezoned for commercial use — a most desirable development for such paragons of the local commercial real-estate fraternity as Ernie Pomerleau, president of Pomerleau Realty and cousin to the spouse of fifty-one years of Patrick Leahy. Notwithstanding the dislocation brought on by the arbitrary decision to turn up the F-16’s takeoff volume, Leahy was a vociferous cheerleader for the selection of the Burlington air-guard unit as the first to receive the F-35 Lightning II, a multirole stealth fighter whose standard takeoff is, by the air force’s most conservative estimate, three times noisier than that of the F-16 it will replace. “Senator Leahy and others have made clear to the air force,” says Leahy spokesman David Carle, that “all practical efforts to mitigate noise will be important and necessary.” But the F-35s will likely require their thunderous afterburners as often as the planes they’re replacing, thanks to the deficient lift of their stubby wings and growth in their weight and drag, which have been increasing thanks to ongoing design fixes. Usually when fighters first enter service, they’re based in a desert state or near the ocean, away from urban areas like Burlington. In the early days of the F-16, when the fleet had flown a cumulative total of 25,000 hours — the prospective maturity of the F-35 by the time of its scheduled arrival in Burlington in 2020 — the F-16 crashed twenty-five times as often as it does now. That would be cause enough for concern if the F-35 were at least as safe as the F-16, but the above examples illustrate that this is very, very far from the case. Carle told me that 2020 will mark a “full decade after [initial] flight testing,” which sounds reassuring, except that the plane won’t begin operational tests to assess its overall suitability until 2018. The report on these tests will not appear until 2020. The air force has, however, produced a legally mandated environmental-impact statement. Among other revelations, the document asserts that “F-35 basing (in Burlington) will disproportionately affect low income and immigrant communities.” In a version updated to account for the latest census figures released on May 31, the air force admitted that the F-35, even without using afterburners, would — once every waking hour, on average, 260 days a year — subject the homes of more than 7,700 people to sound levels unfit for residential areas. Since there are no plans to finance another homeowner buyout, those who find life unbearable will be forced to sell for the best price they can get. Conveniently, this will allow Vermont’s commercial real-estate community to buy into the planned expansion of Burlington’s airport on the cheap. “Airport noise from commercial aircraft and F-16s has been an issue for decades,” Carle told me. “To its credit the air guard has taken steps to minimize it.” Actually, no. The environmental-impact statement states that “the contribution of civilian aircraft [noise] is negligible compared to the military aircraft contribution.” And as noted, the air guard actually boosted noise levels by moving the wing tanks. Carle also cited a 20 percent population increase in neighborhoods adjacent Burlington airport neighborhoods between 2000 and 2010 as evidence of “economic vitality despite the noise problem.” An alternative explanation lies in the fact that many of the newcomers are immigrants, who move where houses are comparatively cheap — for example neighborhoods where aircraft noise lowers property values. 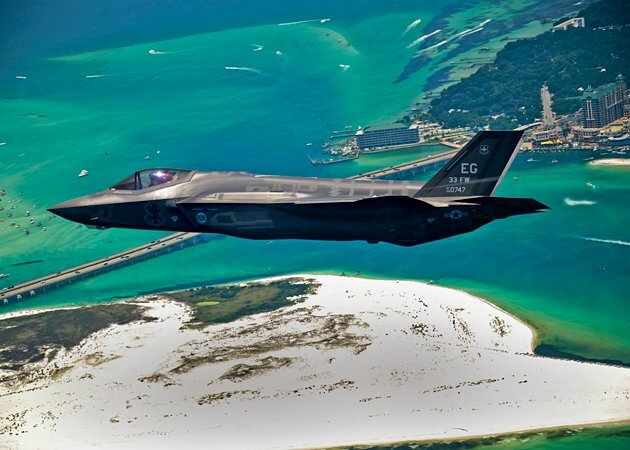 While Senators Leahy and Sanders, Congressman Peter Welch, Vermont governor Peter Shumlin, and Burlington mayor Miro Weinberger have belied their purportedly progressive principles in bringing in the F-35s, local citizens have fought back. Leading the way has been retired air-force colonel Rosanne Greco, who spent twenty-nine years in the service as a strategic intelligence specialist and who two years ago won election to the South Burlington city council. Her fellow council members subsequently elected her chairwoman, and she soon began to issue informed and effective critiques of the basing plan’s effect on low-income homeowners. Her opposition apparently did not go down well with those who believe the F-35 will be good for their business. Two council candidates in favor of the plan suddenly found themselves with more than $20,000 in total to spend on their campaigns in elections held last year (compared with the usual $400 to $500 per seat for campaigns in this area), thereby securing victories that enabled them to vote out Greco as chair and set the stage for the commercial rezoning of areas surrounding the airport. Eisenhower would not have been surprised.